The International Police Association (IPA) is a worldwide fraternal organization for active and retired police that promotes friendship and co-operation among all members in 60 countries. There are approximately 400,000 members worldwide. Region 40 is one of approximately 56 regions that are part of the United States Section. 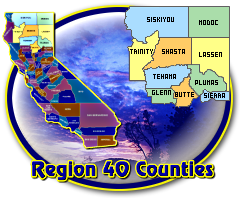 Region 40 includes the 10 counties in North Eastern California. The region starts at Glenn, Butte and Plumas counties in the south then north to the Oregon border and east to Nevada and including Trinity County in the west Northern California is noted for it's scenic mountains, rivers and lakes with Mt. Shasta in the north towering 14,162 ft. and Mt. Lassen, an active volcano that last erupted in 1914, to the east. The Sacramento River has it's headwaters near Mt. Shasta and flows south into the great central valley of California. Just north of Redding it is dammed by Shasta Dam forming the 3rd largest lake in California over 500 ft. deep (158m). Region 40 provides excellent opportunities for anyone looking to escape the crowds and congestion of city life for the wide, open spaces. We offer some of the best fishing, boating, hiking and sightseeing in California. Tour the historic mining towns of Weaverville or Yreka, climb a volcano or ride a whitewater raft down the beautiful Trinity River. These are just some of the exciting recreational activities that await our visitors. The weather is generally quite agreeable with hot summers and wet cool winters. Spring and fall are often the best time to visit but contact us for the latest weather updates before coming to see us. This is especially important during the winter. Please contact us prior to visiting our area and you can expect a warm welcome and a visit you will remember and enjoy. Laurick Ingram joined the group Regions 40-49: Region 40.